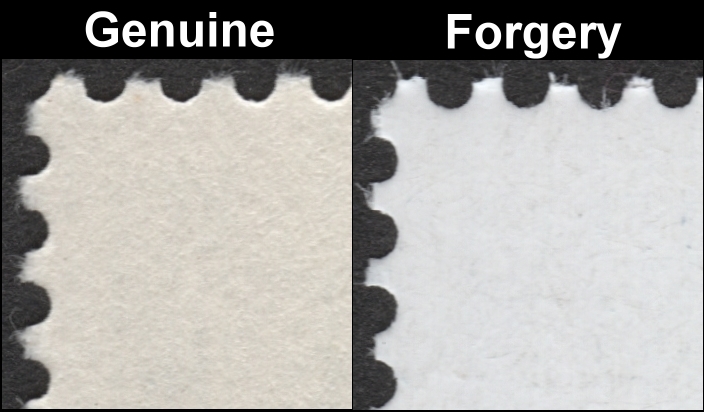 Recently I received a group of the forgery stamps from a dealer who has been victimized by his supplier who was victimized by his supplier. That supplier has been named which is more solid evidence of who the source of all the forgeries I have documented over the past three years is. 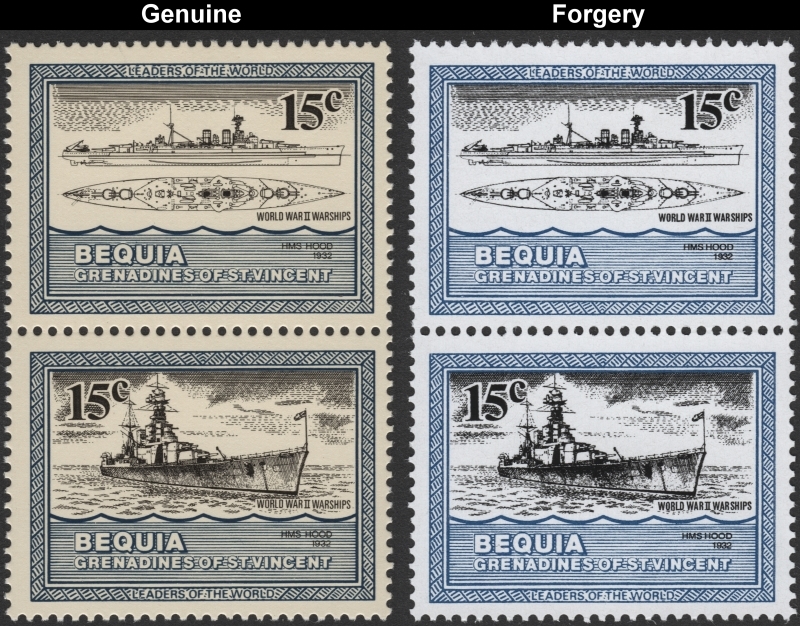 In the new group I have found that the Bequia 1985 Warships issue has been forged by the same source. My research into the printer has enabled me to discover modern fake stamps have been created in 2014!! They are being spread across the world through online auction sites like ebay and Delcampe. Everything about them is fake except for one dangerous fact, they have the correct perf size. The gum type is different in it being white in color and very shiny. This gum type was not used until much later years, long after Format went bankrupt thus proving they were not produced by the Format International Security Printers. Obvious differences will be shown below. 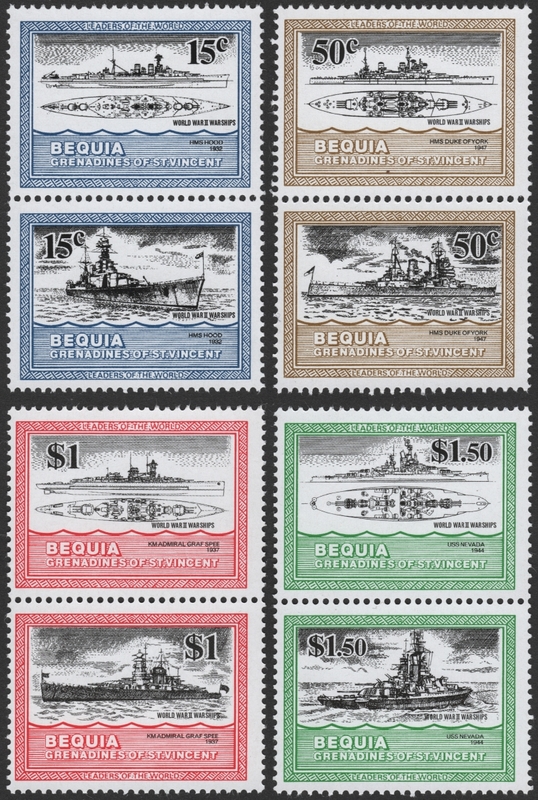 So far I have discovered complete sets of forgeries of the Saint Vincent Bequia Leaders of the World 1985 Warships stamp issues in perforated forms. All have and are being offered online right now as I write this on February 10, 2018. 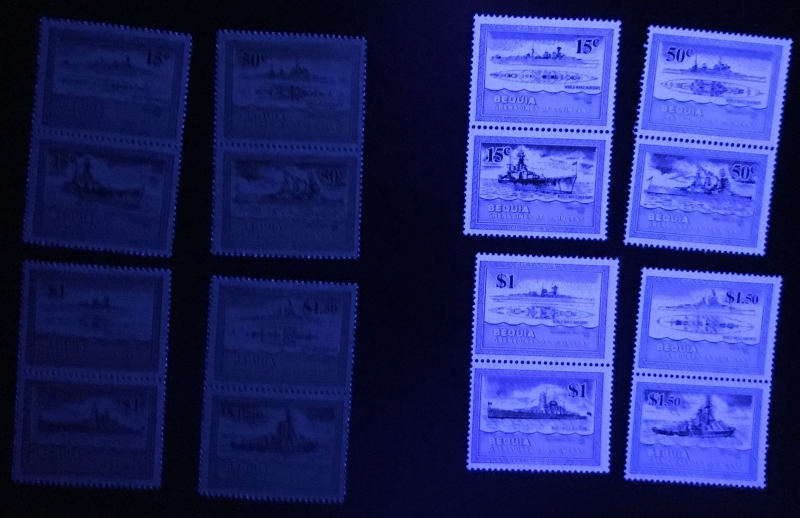 This set of forgeries I purchased from a Canadian seller who sells on eBay and Hipstamps. Another example of how these fake reproductions are now being circulated all over the world. I purchased a genuine set from another seller on eBay after I received the forgeries. This set is not cheap to buy and in searching for it I found that there are not a lot of offers out there showing that this set is becoming difficult to find. I will use them for comparisons. 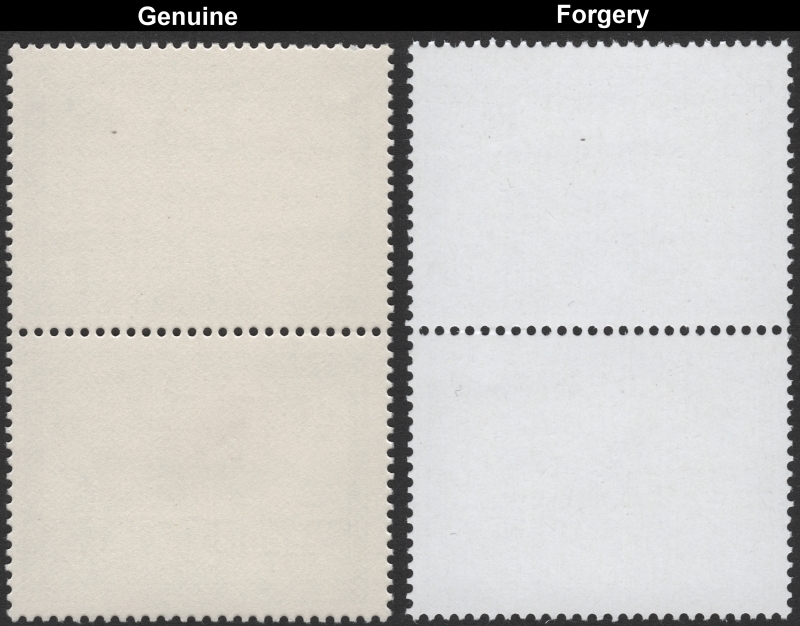 The first and formost way to detect the forgeries is quite simple. The format Printers used a process that they did not commonly use on the thousands of stamp issues they produced. They used a varnish type coating on this set. This gives the stamps an "antique" look. A heavy yellowish stained paper look. The forgeries paper is white as snow in comparison giving them away as the forgeries easily. I have another easy way to detect them as well. Please read on. For the normal perforated version of this issue that I have acquired all of the forgeries glow brightly as this image shows. This is evidence showing even a later creation and since these imperforates did not appear on the market until 2014, it proves these to be modern forgeries of the stamps. 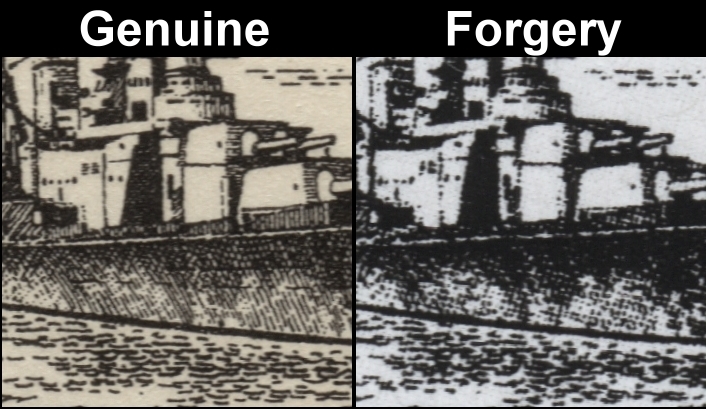 I will use the 15c HMS Hood stamp pairs for high resolution comparisons. I use 1200dpi scans for viewing. These first comparisons show you how inferior the screens are. I compare the area at the middle of the ship. You can see that the screens used are much coarser. Much of the details are lost on the forgery. The forgeries still are very dangerous because when imaged for sale by sellers they look almost the same as the originals. Buyers will think it is just the sellers scanner making them look "different". Of course you can see that there is no varnish coating on the forgery. Note that the lines that make up the drawing are mainly dots on the forgery. Can you see the other easy way to detect the forgeries? Look at the word Warships. 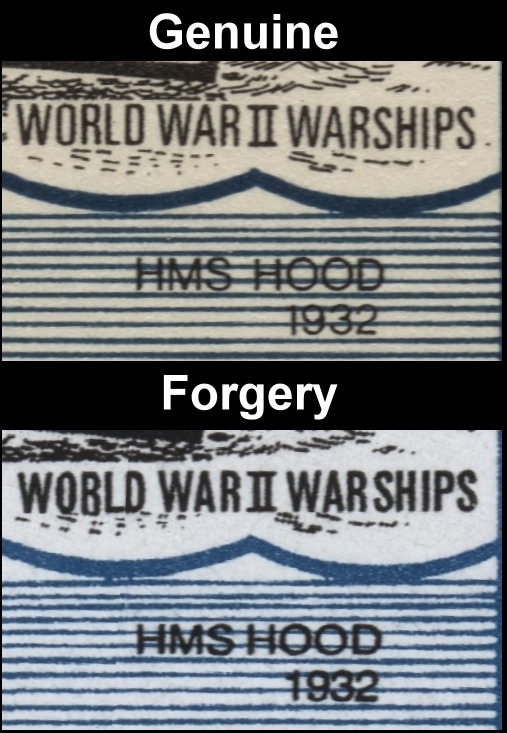 On the genuine stamps it is like this "WARSHIPS". On the forgeries (all four values) it is like this, "WAR SHIPS". A space between the "R" and the "S". 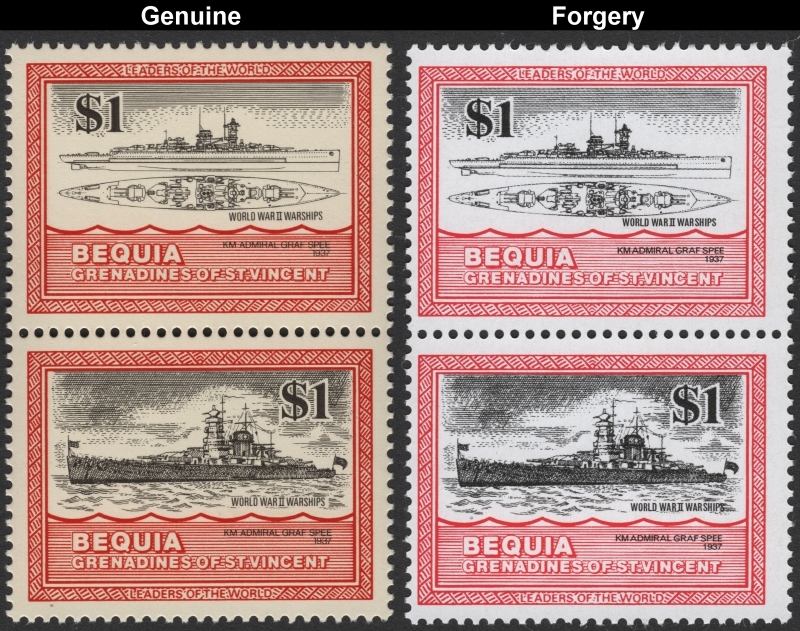 Noting on the forgeries that the letters and numbers for the ship names and years are bolder and smaller than on the genuine stamps. Now let's look at the clouds in the sky. You can see that much of the detail is gone or indistinct on the forgery. 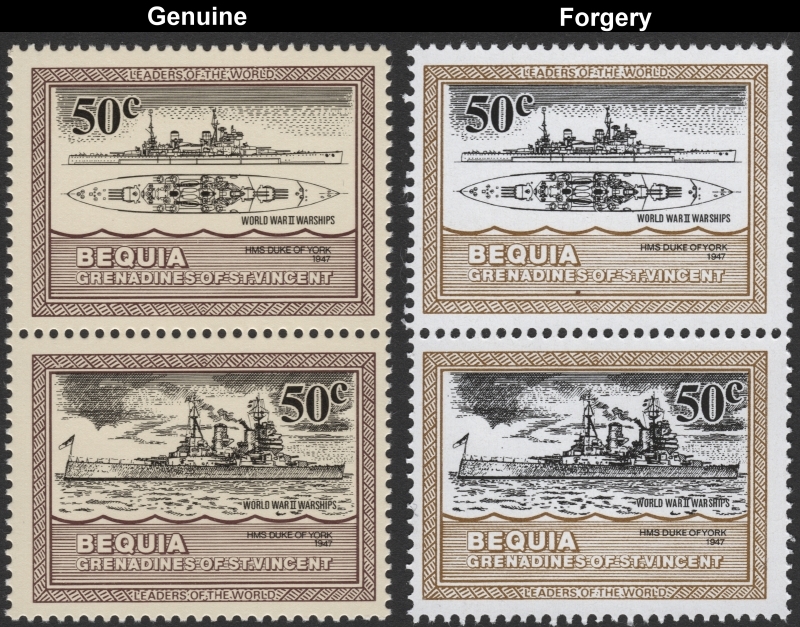 The crosshatching is bold and distinct on genuine stamps. It is a mess on the forgeries. Note the extreme color difference of the frame! I ask you....which would you rather have? The genuine stamp is very dark blue. The forgery is blue. The genuine stamp is dark red-brown. The forgery is brown. The genuine stamp is dark brick red. The forgery is bright pink red. The genuine stamp is dark green. The forgery is bright green. Indeed several issues that I have researched and obtained the original varieties of are effected. These do not effect me at all. I am a professional tradesman and have never depended on stamps to live on. There are many that do depend on stamp sales though and it is for them also that I have created this section of the website. 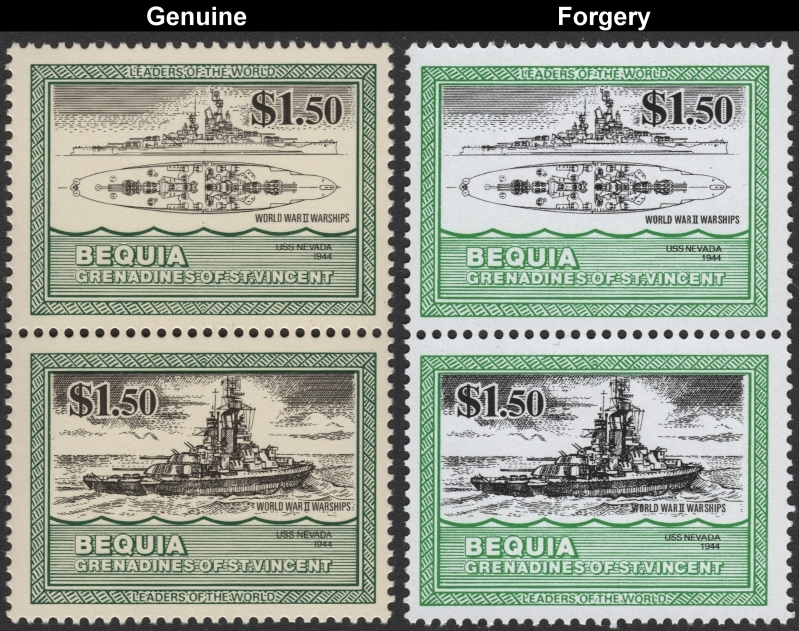 You can now define the Saint Vincent Bequia 1985 Warships of the Second World War stamp forgeries easily and can now possibly avoid being ripped off! Sorry to say this, a lot of you already have been fooled and more of you will be until the right people get serious about it!